Unmasking With EQ: To help illustrate the effect of frequency masking, first listen to this small vocal snippet (Ex11.01:WAV/MP3 ), and then listen to how its subjective tone changes when it's layered with a high-frequency noise signal (Ex11.02:WAV/MP3 ). The vocal signal is no different -- it's just that its upper frequencies are now being masked by the noise source. In order to return the vocal to something like its original tone, I would have to boost its high frequencies by several decibels with EQ, as in this file (Ex11.03:WAV/MP3 ). 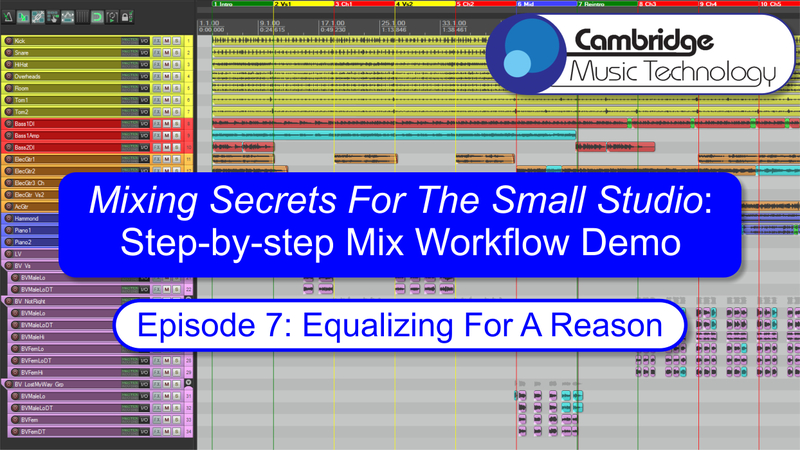 For a more real-world example, check out this Mix Rescue remix, in which equalisation was used primarily for dealing with masking issues (Ex11.04:WAV/MP3 ), and then notice the loss of clarity in this version of the same mix where I've bypassed all the EQ plug-ins (Ex11.05:WAV/MP3 ). Some Applications Of Narrow Peaking-filter Cuts: Narrow peaking-filter cuts (often referred to as 'notches') are extremely useful, yet underused in the small studio. They are most commonly of use with drums, for example in this virtual-instrument 'drum room' recording (Ex11.06:WAV/MP3 ), where a low pitched resonance is cluttering up the low end of the mix. A single narrow notch at 74Hz solves the problem (Ex11.07:WAV/MP3 ). It's not uncommon to need more than one notch, for example in the case of this drum overheads recording (Ex11.08:WAV/MP3 ), which needed cuts at 354Hz and 797Hz to tame some nasty ringing in the snare sound (Ex11.09:WAV/MP3 ). The worst offenders tend to be drum close mics, such as this under-snare mic (Ex11.10:WAV/MP3 ), which needed five separate notches to rein in the more heinous of its pitched resonances (Ex11.11:WAV/MP3 ). Notches aren't just useful for drums, though: unwanted narrow-band resonant peaks can often be found in bass/guitar-cab recordings, as well as in vocal recordings. Here's an example of a vocal recording with this kind of problem (Ex11.12:WAV/MP3 ) -- the unpleasant piercing quality of the resonances is particularly apparent in the second half of the file. Here's what it sounds like with the four separate 8dB notches that were required in this case to get the vocal tone to sit properly in the mix (Ex11.13:WAV/MP3 ). Read further details of the settings in this Mix Rescue. Pitch-related EQ: In some situations it's useful to target EQ specifically at the fundamental frequency and harmonics of certain pitches. The most common trouble-shooting application for this is getting rid of electrical mains hum/buzz from a recording such as this guitar part (Ex11.16:WAV/MP3 ). A series of narrow EQ notches at multiples of the hum's fundamental frequency (50Hz in Europe, 60Hz in the US) can deal with this problem very effectively (Ex11.17:WAV/MP3 ). A similar approach can be used to reduce the levels of certain pitched notes within a mixed sample, as in this case (Ex11.18:WAV/MP3 ) where five different sets of EQ notches were used to reduce the level of the guitar part relative to the vocal (Ex11.19:WAV/MP3 ). But it's not just cuts that are useful, because on occasion you want to actually emphasise a signal's pitched component, as was the case in this Mix Rescue where an over-fuzzed rhythm guitar part (Ex11.20:WAV/MP3 ) was given more note definition using two sets of four narrow pitch-related EQ peaks (Ex11.21:WAV/MP3 ). Pre-ringing Side-effects Of Linear-phase EQ: Although linear-phase EQ has a lot of benefits, it's not without some side-effects, most notably the odd pre-ringing effect you can sometimes get when using narrow peaking filters. Compare these two snare recordings, for example, the first processed with traditional minimum-phase EQ (Ex11.14:WAV/MP3 ), and the second with a linear-phase design (Ex11.15:WAV/MP3 ). Affordable EQ Plug-ins: Cockos's freeware ReaEQ is a good all-rounder, which I end up using for probably 80 percent of my mix work. (Check out this article for some tips on getting the best out of it.) Melda's freeware MEqualizer is also good, especially for its ability to control a whole series of harmonically related notches simultaneously (although I find Voxengo's affordable GlissEQ even better for that specific application). For linear-phase applications I typically turn to DDMF's very flexible and affordable LP10 , although I also really like the sound of Melda's MEqualizerLinearPhase and IK Multimedia's Linear Phase Equaliser . If you want to dip a toe into linear-phase processing without parting with cash, try Voxengo's freeware Marvel GEQ , Slim Slow Slider's freeware LinearPhaseGraphicEQ2 32-bit, or the 'Reduce Artifacts' EQ mode of Cockos's freeware ReaFIR . For characterful 'tonal' EQ, try Sonimus's freeware SonEQ , Stillwell Audio's affordable Vibe EQ (a personal favourite! ), Voxengo's freeware Overtone GEQ , Variety Of Sound's freeware BootEQ 32-bit and NastyVCS 32-bit, Leftover Lasagne's freeware Pushtec 5+1A 32-bit, and the various freeware equalisers in the Antress Modern plug-in collection 32-bit. Affordable Spectrum-analysis Plug-ins: Voxengo's freeware SPAN , Melda's freeware MAnalyzer , and Stillwell Audio's affordable Schope all provide more than adequate resolution for identifying and notching resonant frequencies. On-line Ear Training: Here's a great little ear-training application: Quiztones. What's great about it is that it doesn't just use sinewave tones, but also tests whether you can tell which frequencies different signals have been EQ'd at, which is of much more practical use for mixing purposes. 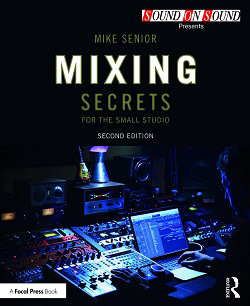 Further Reading: Given that equalisation is such a large part of what mixing is all about, there's something to learn from most Mix Rescue remixes about it. However, this article and this article provide a good overview of what balance equalisation typically entails, while this article and this article focus on the important distinction between 'technical' balance EQ and more creative 'tonal' EQ.